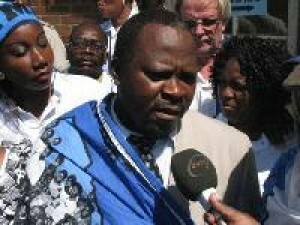 ZANIS—Southern Province Minister Lukolo Katombola has refused to talk to the media over an article that appeared on Watchdog in which he is alleged to have confessed of having been a devil worshiper and once practiced some dark world activities in his life. The Minister who is also Livingstone Central Member of Parliament had earlier in the day called for a press briefing at 11:00 hours and invited all media houses, but when contacted after 11:00 hours over the press briefing, he asked why journalists were desperate to hear from him. He said he would not comment on the article that appeared on the Zambian Watchdog because he did not report to the Watchdog, but to President Michael Sata. Mr. Katombola said he was only going to respond when President Sata asks him to do so. The Zambian Watchdog on Tuesday published a story alleging that the Southern Province Minister had confessed to practicing Satanism during a church service at Tabernacle of Glory Church which is administered by a Pastor identified as Joseph Kaluba. The article alleges that Mr. Katombola revealed that he used to drink human urine to have more money is his pockets. It also stated that the MP who owns a night club which attracts a lot of patrons in Livingstone, called Hit Man, used to see his patrons naked once they entered his night club resulting in him having more money. Tribalising the corruption fight: Sata or the chiefs?